This is a HOT deal to stockpile candy for Halloween!!! or all the holiday parties coming up!! 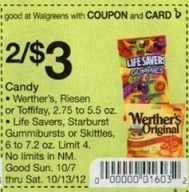 This entry was posted in Walgreens and tagged coupon, ONE, RIESEN, Walgreens by AustinCouponing.com. Bookmark the permalink.